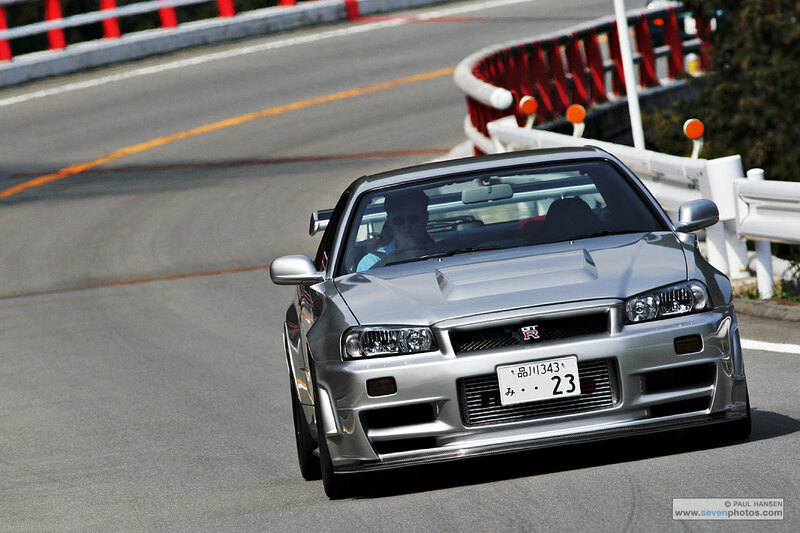 Welcome, everyone, to the 203mph Nismo Skyline GT-R Z-Tune. Designed to crush its supercar competition with relative ease, this Godzilla on steroids is the final word by the geniuses at Nismo's Omori Factory in Yokohama, Japan. The GT-R Z-Tune was originally unveiled as a 600 horsepower prototype back in 2000, a road car created from Nismo's expertise and experiences from Le Mans and Japanese Grand Touring Championship (JGTC). With a bored and strengthened engine block, as well as upgraded turbochargers, the 2.8 litre inline-6 twin turbo engine was capable of producing 600 horsepower and clocking a terrifyingly quick time of 3.8 seconds from 0-60. To put things into perspective, it is far quicker than the high-end Porsche 911 GT3 RS of the same generation, which only had 400 horsepower, and a 0-60 time of 4.3 seconds. 5 years on, the car was redesigned from the inside out. The engine was detuned to produce only 510 horsepower, in the name of durability. A new exhaust with a catalyst were installed, and new dry carbon body panels were fitted in for improved aerodynamics and weight reduction. Brembo and SACHS were brought in to design a new braking and suspension system respectively, so that the Z-Tune would be able to execute corners smoothly at high speeds, and come to a complete stop in a stable manner. Now then, let us take a look at how faithful AUTOart's recreation of Nismo's pride and joy is. The car is stunning from all angles. Although the Z-Tune never rolled out of the factory in Bayside Blue, I am glad that Autoart took the liberty of offering the colour to collectors. This, along with Millennium Jade, defined the R34 generation. They look beautiful on the car, accentuating its lines and creases, and this model is no different. The deep blue hue gives the car presence - even more so than the special silver colour for the Z-Tune. The paint is uniform all around, with only slight hints of overcoating. It is not perfect, but very close. The front is breathtaking. Perforated grilles all around, ultra-realistic lights and the visible Nismo intercooler are just some of the car's highlights. The front carbon diffuser is covered with a carbon fibre texture, while the lip spoiler is in matte black, replicating the graphite one found on the actual car. The bonnet has an aggressive intake designed, originally seen on the GT-R R-Tune. The vents, too, are perforated. However, what I found a bit unsettling is the shape of the headlights. They look a tad too high. The headlights on the real car are slightly slimmer, but they make all the difference in the world. Here is a photo of an actual Z-Tune. The car looks almost millimeter-perfect from the side, except for once crucial point, that is the rear suspension height. It is ridiculously high, and destroys the look of the Z-Tune. I believe that Autoart should not have let that pass their quality inspections, as this is unacceptable for a SGD$170 product. Also, there is a considerable gap between the door and B-pillar that I found slightly annoying. Details wise, everything else is spot on. The door shutlines are tight, the side airvents have perforated grilles, and small details such as the photo-etched GT badges are present. The tyres and wheels - and accompanying brake system components - are stunning. The Z-Tune model sports realistic rubber tyres with accurate tread patterns. They hug around 5-spoke Nismo LM GT4 GT500 wheels, finished in glossy black paint with Nismo logos. Behind them is are metal brake discs, complete with silver Brembo calipers. The two-tone interior is simply gorgeous. The plastics used for the door cards, seats and dashboard feel premium, and are loaded with details. Buttons are all clearly marked, which is quite an achievement itself. The interior is fully carpeted, with an additional Nismo-branded carpets for the driver and front passenger. The aluminium pedals and footrest are standard Autoart affair. The gauge cluster cluster is surprisingly legible, and the steering wheel looks wonderfully life-like. The rear view mirror may look cheap with its off-white plastic, but it is quite accurate to the real thing. Opening up the bonnet, we are greeted by the monstrous RB28DETT Z2 engine. The details inside are impressive. From OEM stickers to warning labels, this is the closest you can actually get to seeing the real deal. Everything inside has been painted realistically. The metallic dark grey engine block sits snugly inside, just under the titanium strut bar, while complex wirings and pipes run alongside it. The battery, complete with orange-coloured labelling, is located on the left side, just above the windscreen washer reservoir. A Nismo-branded metal oil cap sits at the centre front. The bonnet itself is propped up by upgraded metal hinges and a metal stick at the front. Its underside is painted in matte black, to resemble the carbon fibre one in the 1/1 scale Z-Tune. The rear is both beautiful and infuriating to look at. The lenses for the lights are absolutely beautiful and realistic. The spoiler has carbon fibre panels, which are excellent as well. The bumper and diffuser shapes are spot on. The exhaust pipe looks decent. However, it all goes downhill from there. The Nissan and GT-R logos, for starters, are way too thick. The keyhole is merely a tampo printing. Previous Autoart iterations of their R34 models had metal photo-etched keyholes, so this is disappointing. The panel gap for the bootlid is also large. 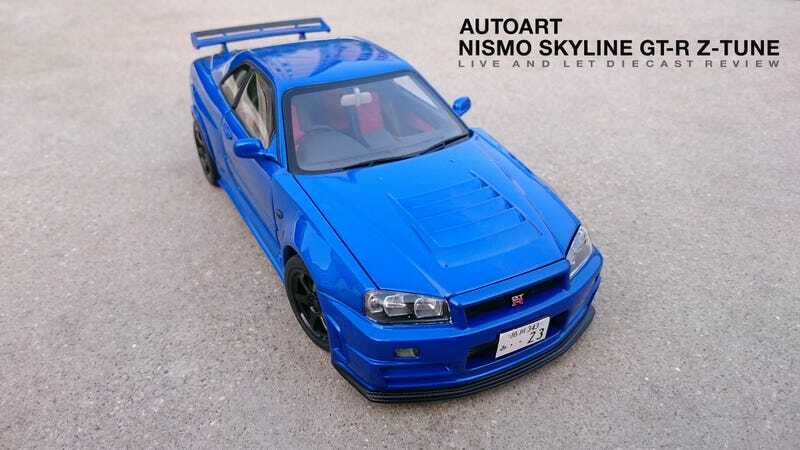 Again, previous R34 models from Autoart never had this problem. Very disappointing. The boot area is fully carpeted, which is relieving to see. There are two struts and two dogleg hinges supporting the bootlid. However, the struts on my model have prematurely worn out, so I have to support it to have it open. Flipping the model over, we immediately another set of remarkable details. The differentials, exhaust system and suspension are all present, as are the coolers near the exhaust pipe. There are wires running all around the front and rear areas, giving the model added realism. They are mostly painted silver and black, so it does seem a tad dull. Very detailed, nonetheless. The exhaust has a Nismo logo embossed on it, bringing the cool factor up a few notches. This is perhaps one of the most enjoyable model cars I have ever owned, and at the same time the most frustrating. There are so many elements to love, and so many to hate. I truly believe that Autoart should have done better. They have made two Z-Tune models before, and the mistakes I have seen on this is not acceptable by any standard. It is not a perfect car by any stretch of the imagination. However, if you are willing to overlook the shortcomings of this car, it should be able to make you happy in the long run with its plethora of details.